Salarpuria Sattva Aspire new residential development project by Salarpuria Sattva Group located in Hennur road, Bangalore. 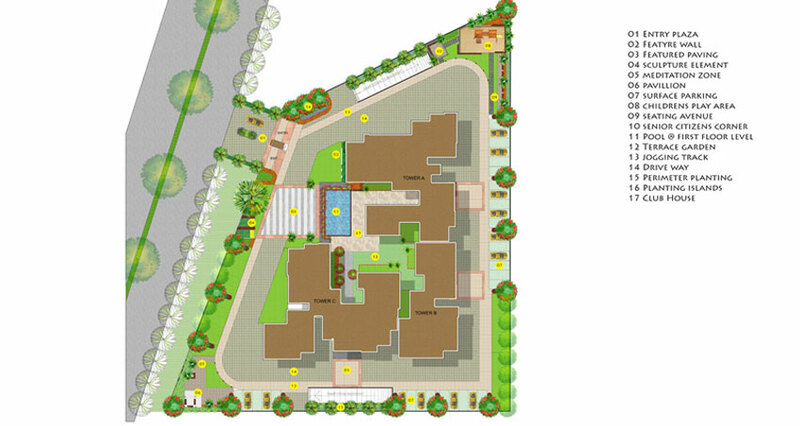 This project spread over 1.7 acres of land with 3 blocks and 119 units. 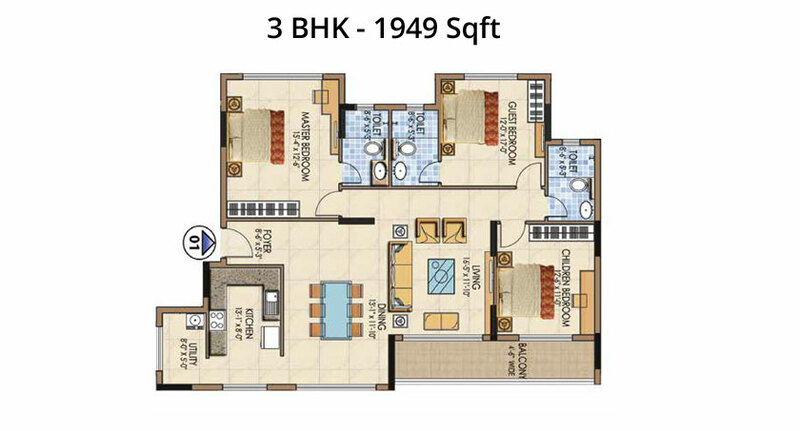 Salarpuria Aspire provides 3BHK apartment built up area with 1832sqft to 2093sqft and basic price range of 98 lacs onwards. Areas that were earlier considered outskirts have witnessed rapid growth, owing to demand from an increasing working population looking at settling close to their workplaces. 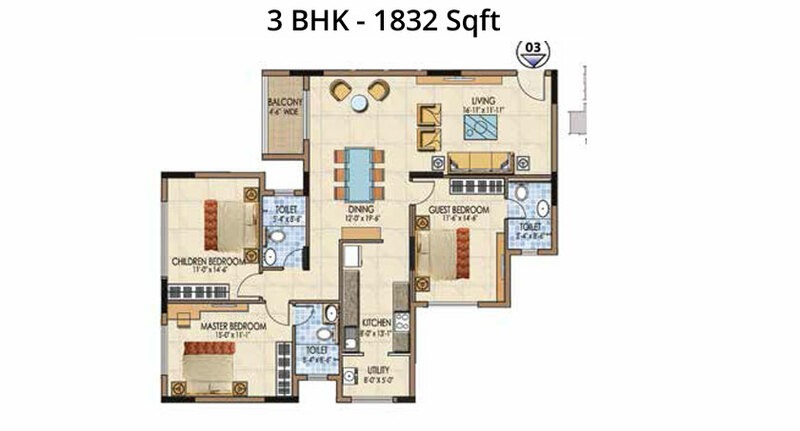 Homes that are Vastu designed to user in good fortune at every turn of life. 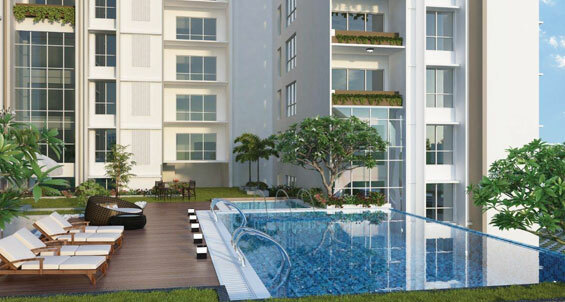 Salarpuira Sattva Aspire not only brings homes it also brings clear skies and fesh air. 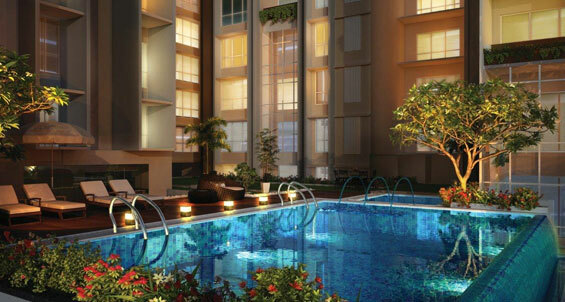 It presents carefully designed flats at the centre of the city yet very close to nature and unpolluted facilities. It does all the justice to the residents and brings ample sunlight, air and plenty of open space where your child can grow and you can relive. Salarpuria group has many ongoing projects like Salarpuria Sattva Misty Charm, Salarpuria Sattva Park Cubix, Salarpuria Sattva Opus, Salarpuria Sattva Anugraha, Salarpuria Sattva Pipal Tree, Salarpuria Sattva Divinity, Salarpuria Sattva Northland, Salarpuria Sattva East Crest, Salarpuria Sattva Cadenza, Salarpuria Sattva Laurel Heights, Salarpuria Sattva Navaratna Residency, Salarpuria Sattva Luxuria, Salarpuria Sattva Celesta, Salarpuria Sattva Magnus, Salarpuria Sattva Water’s Edge, Salarpuria Sattva Melody and many more. The structure has Basement + Ground +12 Floors.It is built on 1.7 acres.There are 119 stylishly designed and spaciously laid out 3 BHK apartments. 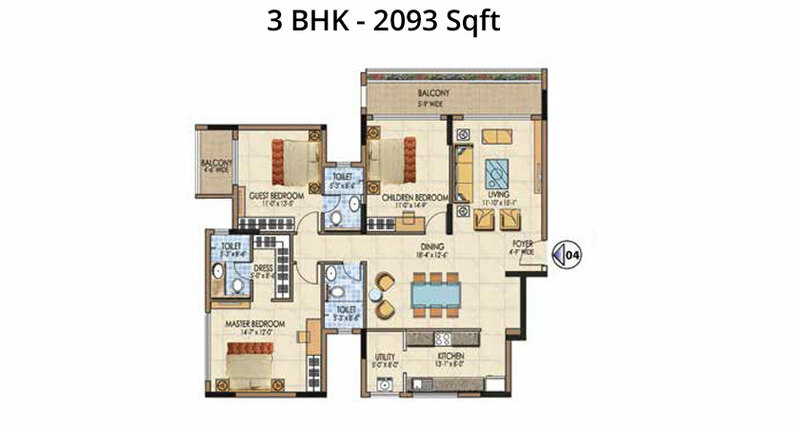 The apartments are in sizes ranging between 1800sft- to- 2100sft. Sprawling over acres of land, Salarpuria Sattva Aspire Bangalore is one of the carefully planned project that is adorned with all the accelerating features of ultra avant garde era, enabling you to sense the exclusivity as well as character at every end. Hence, Salarpuria Sattva Aspire Hennur Road allows you to lead life more auspiciously in the most comfortable manner witnessing the most international level facilities allowing you to feel altered from the blissful living. There are recreation facilities for all age groups.Children's Play Area, Meditation one, Seating Avenue, senior Citizen's Corner, Landscaped walkways, swimming Pool.Indoor amenities include Squash Court, Gymnasium, Recreation Room with Table Tennis and Snooker. Fuss-free and intended for practical living, Aspire has spacious apartments that are well planned to ensure maximum utilization of space. Designed to the specifications of global best practices and stringent environment specifications Aspire promises you the "good life" in the fastest developing location in Bangalore. structure : RCC framed structure with concrete cement blocks. 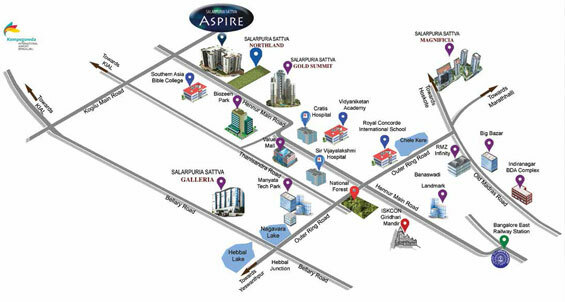 'Aspire' is located on the main Hennur Road a route to the International Airport and in close vicinity to Salarpuria Sattva's Gold Summit. Aspire stands up to its name. Just right for those who are looking for a peaceful and stress- free life. Blue-skies, clean air and close to the best educational institutes. It is just about 10 minutes from Manyata IT Park.